CBRNE (pronounced "CBRN-E") is an acronym for Chemical, Biological, Radiological, Nuclear, and Explosive materials. These materials are very dangerous, and can hurt many people. When they are used on purpose, CBRNE materials are weapons of mass destruction. However, CBRNE events can also happen accidentally. A report from the White House in 2011 said "there is no greater danger to the [United States] than a terrorist attack with a weapon of mass destruction." Because CBRNE weapons are so dangerous, countries around the world are working on preventing CBRNE attacks, and learning how to react to them if they do happen. Police fire tear gas protesters in Quebec. Nerve agents, which attack the central nervous system. Examples include types of pesticides called organophosphates; sarin; and VX. Blister agents, which cause burns and blisters both inside and outside of the body. Examples include the mustard gases. Blood agents, which make it impossible for the blood to carry oxygen to the body. The most common blood agents are made with cyanide. Choking agents, which attack the lungs and make them fill with fluid. This makes breathing impossible. Examples include chlorine gas and phosgene. Incapacitating agents, which are designed to hurt a large number of people, and make it impossible for them to fight back, but without killing them. Examples include tear gas and pepper spray. International laws make it illegal to use chemical weapons. However, terrorists have ignored these laws. For example, in 1995, terrorists attacked the subway in Tokyo, Japan, with sarin. In 2001, a terrorist used a biological weapon against the United States by sending letters filled with anthrax through the mail to many different people. Ricin has also been sent through the mail as a biological attack. In 2006, Alexander Litvinenko, a former Russian spy, was murdered when someone put polonium-210, a radioactive material, in his food. The White House's report says that there is radiological material all around the world that is not guarded. A nuclear weapon releases a huge amount of energy in a nuclear explosion. Nuclear weapons can kill everyone in a city, and make many other people who survive sick with radiation poisoning. Although many countries have tested nuclear weapons, they have only been used as weapons of mass destruction twice. During World War II, the United States dropped two nuclear bombs on the Japanese cities of Hiroshima and Nagasaki. In Hiroshima, the nuclear bomb destroyed 4.7 square miles (12 km2) of the city, and killed 60,000 to 80,000 people right away. 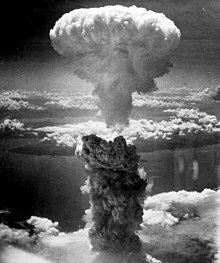 More people later died from radiation sickness and cancer caused by radiation, so historians think about 135,000 people were killed by the one nuclear bomb that hit Hiroshima. In Nagasaki, the nuclear bomb created about 3,900 °C (7,050 °F) of heat, and winds as fast as 1,005 km/h (624 mph). It killed somewhere between 39,000 and 80,000 people. After these bombings, many countries agreed to get rid of their nuclear bombs. However, some countries still have nuclear bombs, and there is nuclear material around the world that is not guarded. Explosive weapons include things like regular bombs and improvised explosive devices (IEDs). Terrorists have often used IEDs to kill and injure soldiers in Iraq. In some other countries, like Israel, terrorists attach bombs to their bodies and make them explode in public places, killing many people as well as themselves. During the Vietnam War, the United States often used napalm ("liquid fire") as part of their bombs. They also mixed it with gasoline and phosphorous to make it more explosive and sprayed it directly from boats and helicopters. During the 2013 Boston Marathon, two terrorists used explosives to kill three people and hurt 264 others at the Marathon's finish line. During the November Paris Attacks, a group of terrorists known as ISIS brought bombs to public places and exploded them. ↑ 1.0 1.1 1.2 1.3 1.4 "What is CBRN?" (PDF). ceep.ca. The Centre for Excellence in Emergency Preparedness (Ontario). Retrieved February 3, 2016. ↑ 2.0 2.1 2.2 2.3 2.4 National Science and Technology Council Committee on Homeland and National Security, Subcommittee on Standards (May 2011). A National Strategy for CBRNE Standards (PDF) (Report). Office of Science and Technology Policy. p. 4. Retrieved February 3, 2016. ↑ 3.0 3.1 3.2 Hayer, Robert J. (January 10, 2006). Introduction to CBRNE Terrorism: An Awareness Primer and Preparedness Guide for Emergency Response (PDF) (Report). The Disaster Preparedness and Emergency Response Association. Retrieved February 3, 2016. ↑ "U.S. Strategic Bombing Survey: The Effects of the Atomic Bombings of Hiroshima and Nagasaki, June 19, 1946. President's Secretary's File, Truman Papers". Harry S. Truman Library & Museum. p. 9. Retrieved February 3, 2016. ↑ "Fact File: Hiroshima and Nagasaki". bbc.co.uk. BBC. September 2005. Retrieved February 3, 2016. ↑ Crane, Conrad C.; Van Rhyn, Mark E. "The Atomic Bomb (6 and 9 August 1945)". PBS: The War. PBS. Retrieved February 3, 2016. ↑ "Hiroshima, Nagasaki, and Subsequent Weapons Testing". World Nuclear Association. December 2014. Retrieved February 3, 2015. ↑ Kotz, Deborah. "Injury toll from Marathon bombs reduced to 264". The Boston Globe. Retrieved February 3, 2016. This page was last changed on 4 January 2019, at 10:27.